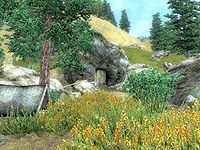 Broken Promises Cave is a small cave southwest of Chorrol containing bandits. It contains only one zone, Broken Promises Cave. This cave contains 32 Cairn Bolete plants and 18 Wisp Stalk plants. There is 1 empty hist bottle. There is no evidence of the Blackwood Company or explanation of its presence. 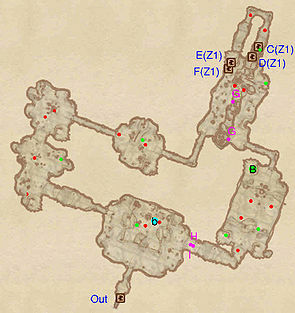 This location's map marker (M on map) is named Broken Promises Cave (editor name BrokenPromisesCaveMapMarker). The entrance door is N of the marker, 90 feet away. A small bandit camp is located right outside the cave, with up to 2 possible Bandit Enemies (each 50% probability melee , 25% archer Bandit, 25% Dog), and 1 bedroll (at b). A gate to Oblivion can open just east of the cave. If the gate is open, 1 Daedra can spawn near the cave. The boss chest in this cave (at B) is very easy to access. It can be reached without exploring most of the cave, and is not protected by nuisance animals only; on your way through the tunnel beware of the Pressure Plate at H, triggering the Swinging Mace at I. This cave is one of the only caves that has doors to get from one place to another within the same zone. The trapdoor at F (upper level, main cave) connects to the trapdoor at E (tunnel). The trapdoor at C (tunnel) leads to the trapdoor at D (canyon in main cave). It all basically provides an elaborate system for getting out of the canyon (where the rockfalls at G occur) if you should by mistake fall in. Intentionally jumping into the canyon is not recommended because it is a fairly long fall (about 100 points of damage), and there is nothing of interest in the canyon. The tunnel contains one standard loot chest. 1 Pressure Plate trigger at H, which releases the Swinging Mace trap at I. 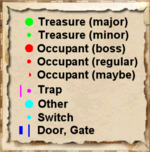 There is one door in/out of this zone, and four doors within the zone. 4 doors (at C, D, E, and F) interconnect the main cave, tunnel, and canyon sections of the cave.